Here's the problem when you click the new Olympus 12mm f/2.0 prime lens into place on the redesigned E-P3 body: You never want to take it off. Seriously. The 12mm f/2.0 looks amazing against the matte black body of the E-P3. The feel of the machined metal, design of the barrel, and that big objective glass in the front is addicting. Sharp. Edge to edge sharpness. Snap Focus. The focus ring can be pulled back toward the body allowing you to manually focus the camera with a dampened feel that harkens back to the day of great prime lenses. I'm also thinking of what I can do with this when recording full HD movies with the E-P3. When I work with the E-P3 and 12mm prime, in all honesty, I feel like I have that top of the line German camera I always wanted, but could never afford. That doesn't mean this combination is cheap, but it's within my range. 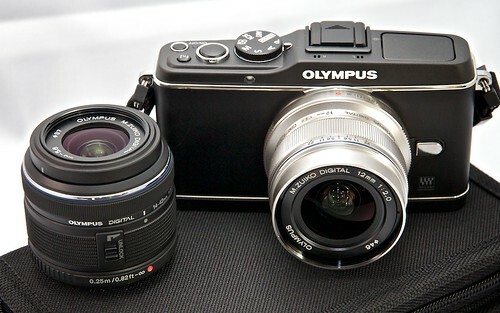 The new Olympus PEN E-P3 with the redesigned 14-42mm zoom is $899 US. The 12mm f/2.0 prime lens is $799 US. For about $1,700, you get a solid, state-of-the-art digital body, a zoom, and a fast prime lens. (As shown in the top photograph.) That's nice. I'll be writing more about the E-P3 itself. You can read the basic overview of the camera here. And here's more information on the 12mm f/2.0 prime lens. I've published a set of images on Flickr that show you different views of the camera and some photos captured with the 12mm lens. More to come on all of this! How much is the 45mm one. Both are very cool and very tempting. Any chance you were able to test the 12mm on your E-P1? I'd love to hear how the focusing compares for the lens on the older body. Also, has Olympus improved the menus on the E-P3? The 45mm, when available, will be $399. I'm very much looking forward to testing that one. The DoF control should be wonderful. Now do I go with the E-P2 (and later have buyer's remorse that I didn't wait), go for the EP-3 and hope that it's available before my August 22 departure, or take the 7D and buy the EP-3 later. I know that Olympus says the camera will be out in August but I don't suppose that anyone has a sense of when it will be available to common folk like me. I imagine that it will be hugely popular and difficult to get at first. What a horrible first-world problem to have. Hi Charles, in my testing, there is a big difference between the E-P2 and the E-P3, most noticeably, the radically improved autofocusing speed. I would strive to get the E-P3 if at all possible. Looking to replace my Nikon D90 for taking pictures of family,vacations, kids sporting events(baseball, soccer & lacrosse). Becasue I need to lug around in bag I tend to leave D90 home an use iPhone. I can easily fit the E-P3 even with 14-42 in belt attached case and would end up using more than D90. Any advice? CAdams: Having owned a D90 and having also tried the E-P3 recently (I got a half-hour at an Olympus event to play with it and take home some jpegs) I think that for you buying the Olympus would be a lateral move at best. Personally I like the m43 cameras and find their size/weight-to-quality ratio really hit a sweet spot, but if you want a travel camera you'll need a general zoom lens (like the kit lens) plus a lower light lens (like the new Olympus 24mm or the Panasonic 40/1.7 equivalent) so this would bring you to $1100-$1200 just to save a pound or so. The Olympus's autofocus is super fast for a contrast-detect camera - and about equal to the autofocus of the D90 actually. Both cameras are 12MP. So is is worth it to you to spend that kind of money for a 2nd system that's merely smaller and somewhat lighter? I'd cefinitely recommend micro 4/3 to someone moving up from a compact camera but I'd be hard-pressed to recommend it as a 2nd system when the overall responsiveness and image quality is about equal to your current 2-year-old Nikon design. FYI, we don't know yet how the improved the new sensor is when dealing with RAW but my experience with the current generation of m43 cameras is that images tend to fall apart in 8x10" sizes beyond ISO 640, whereas the D90's tipping point was about ISO 1250. In RAW the Nikon's NEF files also seem to have a stop or two more headroom for adjustments than Panasonic RW2 files I shot, and it's pretty easy to blow out the skies with m43 cameras. Something to think about. This combo is my "take everywhere" camera. I also have a 40-200 lumix that's too hard to focus at the 200 mark, through the rear screen.I'm used to a viewfinder. i also have a 50mm zenit lens that shifts. this whole kit is one third the size of my canon outfit. Well I preordered a Pen E-P3 with the 14-42mm zoom and hope that it makes it here before I leave for my vacation. I actually ordered a silver model thinking that that finish will make it look superficially more like an inexpensive point and shoot and attract less attention from security types. We'll see how that works out. 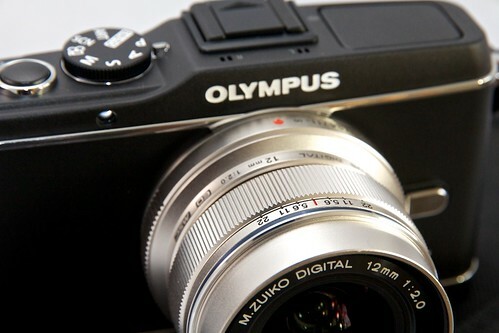 The Olympus Pen E-P3 focuses like a snail. It's a gimmick because 24mm has greater DOF so the lens are not moving at all on F5.6 or higher. Using the Adapter with my $6,000.00 Olympus ED 90-250/2.8 lenses, the AF is bad. Maybe it was a prototype model until Olympus rep removed my lenses. 1. Can this camera shoot tethered? 2. Why don't you put the real focal length on all of your lenses, if you claimed you've built these 4/3 from the ground up? 3. Why are all these micro 4/3 zoom lenses are so slow? Olympus Pen E-P3 with kit junk lens and the 24/2.0 run $2,000.00. Yes, that with shooting outdoors on bright sunlight-you'll need the electronic viewfinder. All Olympus Staff COULD NOT answer them. We'll start of with the greatness of this lens. This lens is the best constructed m4/3 yet. It is optically amazing and fast. The autofocus is ultra silent and quick (I only have Pani bodies). The feel of this lens is magnificent. When you pull back the ring to manual focus, it has hard stops and the focus speed is variable depending on how fast you turn the ring. While not up to the quality of Leica (what is? ), this lens is a true gem. There are currently only 2 m43 lenses that go this wide (7-14 and 9-18) and they are bigger, heavier, and 2 stops slower. I am not sure why the m43 bunch is caught up on the 28mm length but this lens is a welcome step in the right direction.